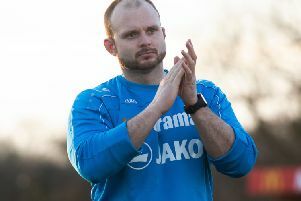 Hemel Town boss Dean Brennan was full of praise for the attitude shown by his side as they successfully negotiated a potential banana-skin in the FA Cup second qualifying round at Bury Town. The Tudors got the job done in impressive fashion as goals from Dennis Oli, Oliver Hawkins and Matty Harriott saw off a plucky Bury side to set up a home tie with Sutton United in the next round. It was a tricky tie and I thought that the players’ attitude towards it was first class. “It was a tricky tie and I thought that the players’ attitude towards it was first class,” said Brennan. “Their application was excellent, and from minute one they got right in the oppositions’ faces. “This counteracted what we knew they were going to try and do; trying to get at us. We could have been out of sight at half-time to be honest. Hemel struck early to allay fears of a cup upset, and Brennan was thrilled with the hard-working display his side delivered on the day. “The first goal is always important in any game – whether it is early or not, it doesn’t really matter. I just though overall we were excellent,” he said. The third qualifying round draw sees Hemel face fellow National League South side Sutton in consecutive games – away in the league this Saturday before the cup clash at Vauxhall Road seven days later. But Brennan insists his side will be fully focussed on this week’s duties, before turning their attention to cup matters.